When are the pick-up times? What happens if I’m away on both the Saturday and the Tuesday of one of my pick-up weeks? Can I send a friend to pick up my share? Certainly. If you will be out of town for one of your pick-up weeks and would like to have a friend pick up your share, just let them know to tell us when they arrive who they are picking up for. If I usually come on a Saturday and can’t make it to pick-up, what do I do? Since the distribution cycles begin on Saturdays, you may come on the following Tuesday. If I usually come on Tuesdays and can’t make it to pick-up, what do I do? Again, since the distribution cycles begin on Saturdays, you may come on the Saturday prior to your usual Tuesday pick-up. Do I have to pick up on only Saturday or only Tuesday all season, or can I switch between the two from week to week? You are welcome to switch between the two. If you aren’t sure whether a given pick-up day falls within an “A” week or a “B” week, check out our Pick-Up Calendar. If I am an every other week member, may I switch from “A” week to “B” week (or vice versa)? We will generally allow one switch per member per season, acknowledging that flexibility is important to our members and consistent harvest counts are important to us as the farmers. However, if you’d like to switch completely to the other set of weeks, just send us an email and we can do that for you. A sliding scale is a variable price structure, designed to allow the farm to meet its expenses while opening membership in the farm to a wider range of people. 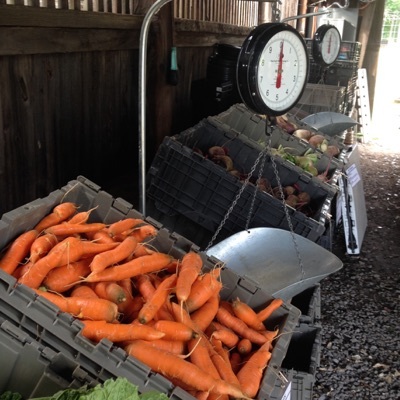 Members who choose to pay towards the higher end of the scale help the farm invest in appropriate equipment and infrastructure, while keeping membership affordable to those with greater financial constraints. Our shares are offered on a sliding scale basis. Members choose the specific amount that they will pay within the range of the scale. Big Every Week Shares cost between $725 – $925. Big Every-Other Week Shares cost between $390 – $490. Little Every Week Shares cost between $425 – $525. Is there a work requirement? Do members have to contribute sweat equity for their shares? Nope. We do not require sweat equity, and you do not have to work on the farm in order to receive your share. Do I have to harvest my own vegetables? Nope. 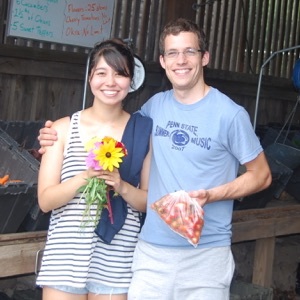 All shares will be harvested by the farmers, though we will have some pick-your-own items throughout the season. Can I volunteer at the farm? 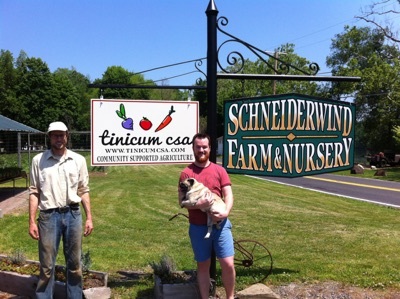 Does Tinicum CSA offer internships, apprenticeships, or part-time work? The Farm Apprentice & Field Helper positions are filled for the 2019 season. Learn more here. 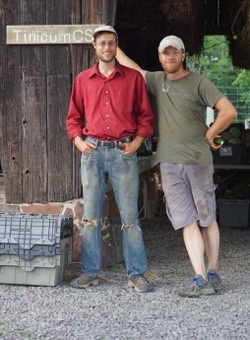 Although Tinicum CSA is not certified organic, all our produce is grown in accord with organic principles and methods. We do not use any pesticides or synthetic fertilizers. We do not spray anything. Everything we grow is GMO-free. If you have any questions about our practices, you are welcome to stop by, ask questions, and see our fields for yourself! We believe that this direct, person-to-person trust and transparency is more meaningful and sustainable than paying a third-party certification corporation to vouch for our growing practices. How much do I get in my share? Shares range between 5 and 15 pounds of fabulous, seasonal produce per week. Click here to see some sample shares. 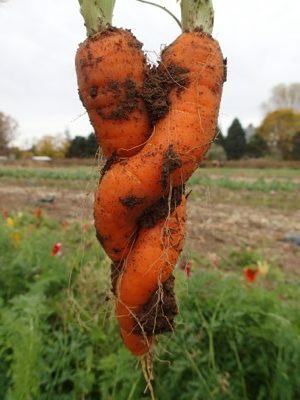 What do I do with this vegetable? We have loads of recipes on our website, and you can search them based on the vegetable you’d like to use! Click here to go to our recipe catalog. If you would like customized driving directions, please click here. How does Donating a Share work? We have partnered with The Lord’s Pantry in Ottsville, PA, to match us with local families who will benefit from receiving one of our shares. When someone chooses to donate a CSA share through us, they send us the cost of the share (or half share) to cover our production costs. The Lord’s Pantry then puts us in contact with a suitable family to receive the share. We welcome that family into the community of our members, and the recipient family comes to the farm to pick up their share just like any other member. Yes. Donors will receive an acknowledgement of their donation from The Lord’s Pantry, and they may use this acknowledgement to deduct their donation from their taxes.